The Fellowship was fortunate enough to obtain a copy of STAR TREK #6 from IDW Publishing. Mike Johnson wrote the story based off the original teleplay “Operation: Annihilate!” by Oliver Crawford and Steven W. Carabatsos. The art is by Joe Corroney. This is the concluding chapter of the classic STAR TREK episode “Operation: Annihilate!” that takes place in the new timeline set forth in the 2009 movie. While Dr. McCoy is treating Spock from injuries sustained by the alien life form that is on the planet Deneva, Scotty is trying to find out what is causing the force field that is affecting the Enterprises engines. Spock developed a way to destroy creatures and free himself and the colonists. But will Spock’s theory work and what will it cost? I have enjoyed this new series and taking the classic episodes and altering them due the change in the timeline. If you are familiar with the episode and haven’t read issue #5, I won’t spoil the change in this episode, go read the book! While it doesn’t have a major affect in the outcome of the story, I enjoyed it. Corroney’s art is great and does an excellent job carrying the actor’s likeness throughout the book. I am definitely interested in the next issue as it’s an all-new story and will deal with some of the issues that came about from the movie. This will be the first original story and I’m curious to see how this will go. 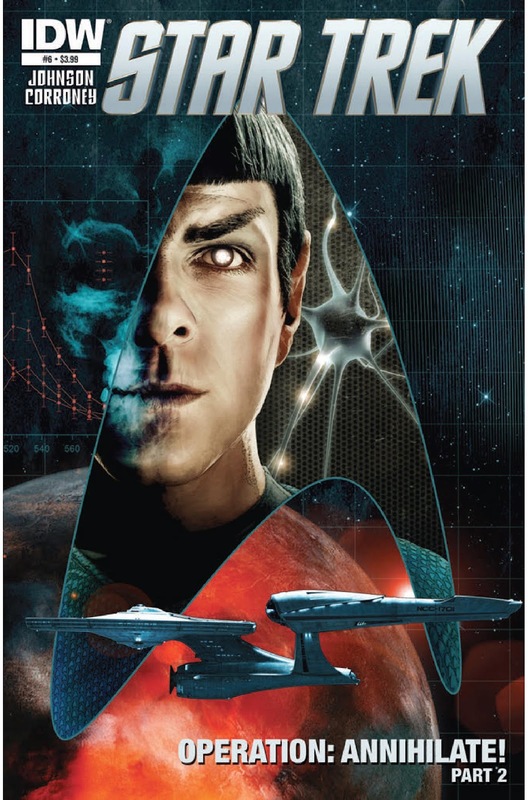 STAR TREK #6 is in comic book stores now or available at www.idwpublishing.com.